Unusual doesn't even begin to describe this piece. 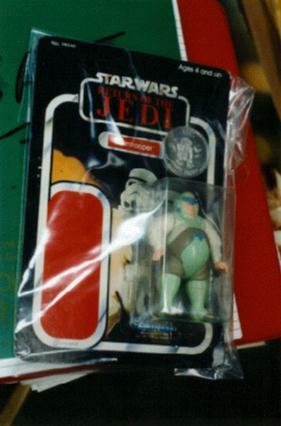 This is a production-quality figure that has been attached to a production ROTJ Stormtrooper card. It's too bad they didn't have a correct card to use here in order to display the original artwork. The bubble and backing bubble were made exactly for this particular figure. Since this second series Droids figure was pretty close to actually being released, most of it was beyond just the initial prototype stage therefore the figure is machine made and the bubbles are to exact size. The coin included on this figure is R2-D2 - Rebel Droid though this wouldn't be the first sample figure to include the wrong coin. Actually, the correct coin was made for this particular figure and has shown up for sale before. You'll notice that it's attached to the right side of the card just like the rest of the Droids figures. This was probably a packaging sample created to show the final bubble scheme and possibly for use in some type of transit test.